Let’s start with the yarn. Many yarn companies donate the beautiful yarn we use to make comfort scarves. Many supporters donate $$$ so we can buy whatever additional yarn we need. We used 4 yarns to make the 100,000th scarf. 1. The fun fur on each end was donated by Lion Brand Yarn. 2. The flag yarn mixed with the fun fur was donated by Crystal Palace Yarns. 4. and we bought the main yarn (A) used all the way through the scarf. 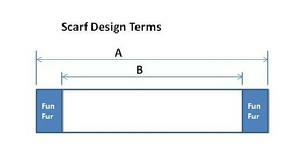 Now that we have the yarn, let’s review how it becomes a scarf. Several volunteers measure the fun fur. Other volunteers measure the B yarns. Every Tuesday, volunteers wind A, B, and fun fur into Magic Ball kits which we distribute to scarfers in our area and throughout the nation. 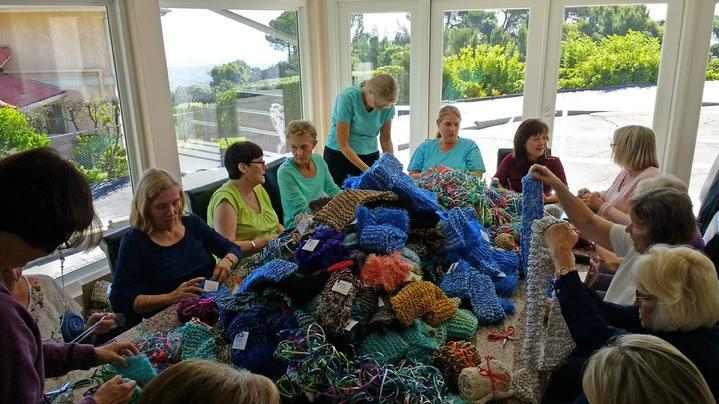 Volunteers knit (or crochet) the Magic Balls. One of our local volunteers actually knitted the 100,000th scarf shown in the photo above. But every one of us could have knitted it, no question. But we’re not done yet. Remember we send our Magic Ball kits to scarfers all over the country and then they send the finished scarves back to us. Finished scarves are checked by another group of volunteers for quality and to ensure signed gift tags are attached. (Note: gift tags are made by another volunteer and different volunteers punches the holes so we can attach them to the scarves.) 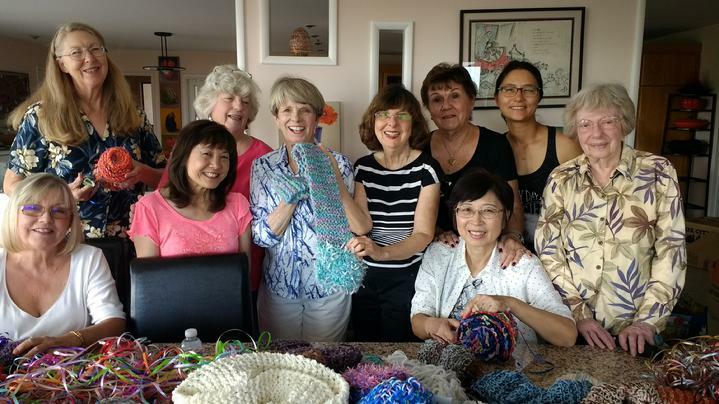 Finally, many volunteers participate in wrapping the finished scarves with ribbon. (Note: ribbons are donated by another committed volunteer). 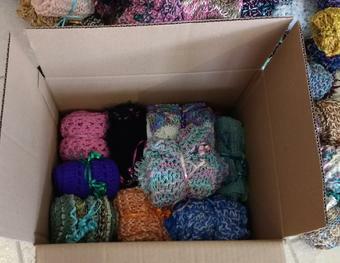 Only at this point do we consider a comfort scarf “finished” and ready to pack in boxes and ship to one of the 70 shelters for abuse survivors that we serve. How long does it take? As you can see, it takes a long time and the huge commitment of a lot of people to make a scarf and get it to a shelter. So many people participate in so many different capacities, in even more than the jobs mentioned above, I am moved every time I think about it. A comfort scarf is a much bigger gift than just the scarf itself. It is the result of the love, dedication and handiwork of a huge team of Handmade volunteers and donors. Thank you all. I think those who receive our scarves feel the love and caring that goes into each scarf. That is the reason our scarves mean so much to them. Now that we’ve shipped the 100,000th scarf, what happens next? Certainly, Handmade is moving forward. Domestic violence hasn’t abated even though we’ve distributed so many comfort scarves. In fact, as a subject, it’s much more widely discussed than ever. Since our 100,000th scarf celebration, Handmade has experienced a few dramatic changes. Since we started at the end of 2008, we met every Wednesday evening (5 to 7 p.m.) at Concepts in Yarn to pick up kits, knit, talk, and have a good time. Now we are meeting (same day and time) at Michael’s, 4240 Pacific Coast Hwy, Torrance, CA 90505. Every week they warmly welcome our group. Charlie, their customer experience manager, prepares the room for us. On our first evening, it was more than 100 degrees outside, but coolly air-conditioned inside. We loved it! It really felt good. We’re picking up kits, knitting, talking, sharing news and having a good time at Michaels on Wednesday evenings. We have a new home. We're stilling figuring out the best place for members to pick up kits and leave their finished scarves if they can't join us on Wednesday evenings at Michael's. We have one bin of kits at Silver Nails, 2040 Pacific Coast Highway in Lomita, but I think no one actually has picked up kits there yet. We’re still hoping for a location near Redondo, maybe another in N Torrance, and another in the PV Dr. South area. That would cover our four corners. If you have any contacts or suggestions, please let’s get busy trying to set up something. Next week is our final shipment for the year of at least 3,000 scarves (so as they can get to the shelters before their holiday parties). As you well know, abuse doesn’t follow a calendar (except for the certainty that there will be a lot of it on Super Bowl Sunday), and we’ll start shipping again in January. Please, don’t stop making scarves just because we’re done shipping for 2017. Thanks for all you do for abused women and domestic violence survivors through your support for Handmade Especially for You. Give yourself a big pat on the back. You deserve it! Keep up your hard work. It really does take a village, and you’re a valuable part of it. 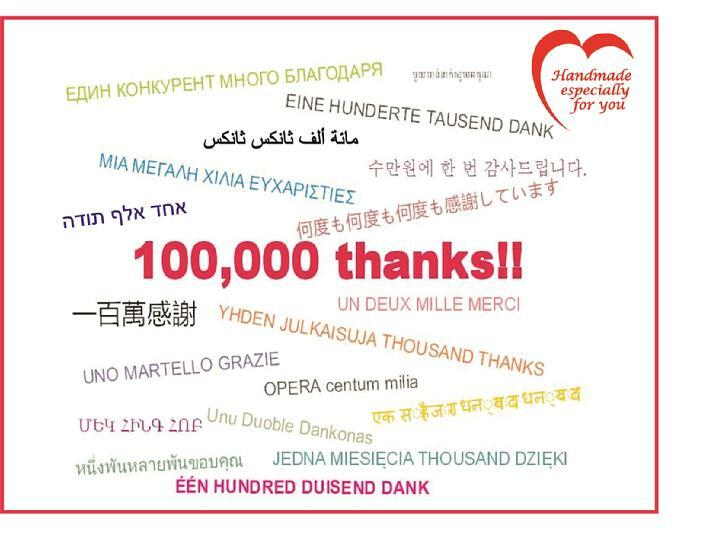 Thanks for supporting Handmade Especially for You. I appreciate, and so do all the abused women who receive our comfort scarves. Handmade Especially for You is a 501(c)(3) tax exempt non-profit charity, so your donation is tax-deductible. We provide appropriate receipts for all donations. 100% of cash donations go toward helping abused women, paying for shipping scarves to shelters, etc.